It takes a special knowledge to know how to paint our pregnant models. Everything from keeping them comfortable, knowing how to make your design flow with the body and so much more!!! Join Monique in this exclusive class learn from the best how to make an experience for the mom to be that will last a lifetime. Sign up now before it fills up, spots going fast! Fast facesfor all events and then POW!! Turn them into an elegant /powerful design! Each student recieves a #2L Mark Reid Signature Brush and a Mark Reid Glittermark! Tired of doing the same old designs over and over? Let’s change them up!! Learn how to change your old designs into new exciting works of art! There are no limits to your creativity! Each student will receive a #4 Mark Reid Signature Brush and a Mark Reid Glittermark. Join Nick Wolfe for a day exploring the dark arts. Learn the techniques of brush and sponge;the theories of light ,shadow and color;and the phylosophy of design and balance. He will provide practice faces to paint on as well as the tools necessary to transform anyone into their worst nightmare! The workshop is from 10-5 with a lunch break. Don’t miss it! Do you want to know why your butterflies look smashed, why your dolphins look like whales, why your tigers are tired and your unicorns look like beagles? For years I’ve been helping painters figure out ways to improve their face painting online and they have wished that I could help them in person. Now is your chance to have an experienced instructor honestly critique your face painting and help you improve and go home a better painter. I will literally be holding your hand while we work on your line work, sponging and those design flaws that are making you crazy. This is not a class for those that can’t handle critique or don’t need improvement. I will be consulting with each student before convention on what they want to improve and come up with a plan for each one so class size is limited to 10 students. You will be sending me photos of your designs you need to work on and I will help you in class and this will also help the others taking the workshop. I need your commitment to improve so this will be a full-day class pre-paid through Painted Party so we can communicate before the workshop. 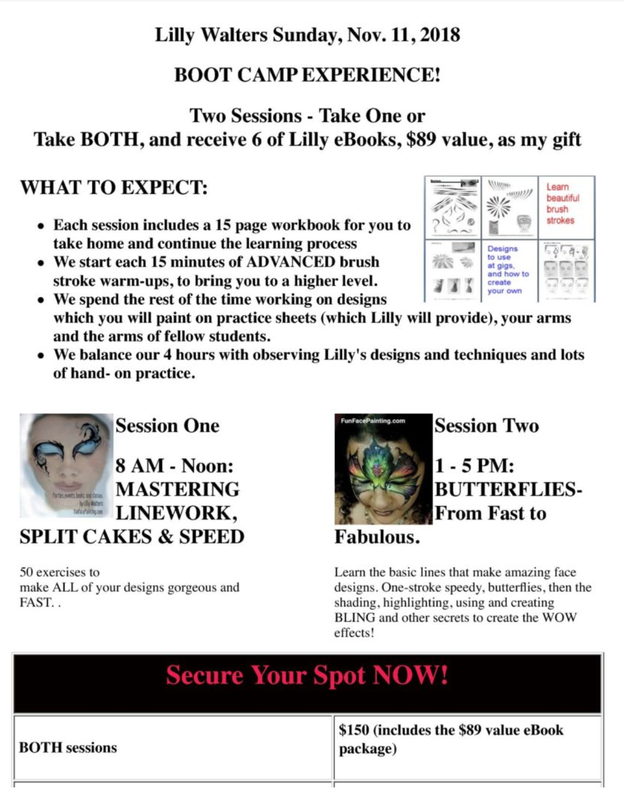 Please contact me at denise@paintedparty.com for more details about the workshop and payment information. Jocelyn will show you great tips and tricks to create colorful face painting designs that you can use at any festival or birthday party. From butterflies to zombies, Jocelyn will show you some quick designs for the guest who want a simple face painting, to more elaborate face painting designs that will transform a person into a new character. Unlocking your potential to entertain and impress adult clients at high end events! Love painting adults, but can’t get them into the spirit? Need a break from face paint life, and want a few more gigs which treat you like the VIP? This class is for you! Focus on how to create fun avant-garde looks by incorporating beauty makeup with fantasy eye designs with matching Décolletage for adults! Bring out the sparkle of your unique client and easily put more money in your wallet! We will explore how you can give them a personalized, perfect face makeup based on their cues. Learn how to use layering with a pigment palette alongside of your paints to create a beautiful upscale look. We will cover contouring with beauty makeup, and making your high end clients sparkle. Discover the way to paint a design which compliments each face shape. You will also feel fabulous wearing it! I will show you my favorite tricks when painting eye designs including my whip and chandelier technique… and how to use gold leaf. You will learn how to creatively upsell the eye art with minimal extra time, as if it were a full face of makeup. Impress your clients and book bigger paying gigs because you have product knowledge and understand key skills in beauty makeup… but also know how to speak to sell it! There will be awesome handouts in class, and room to take notes! In this class we will learn the magic of Beauty makeup from everyday to Fantasy. The first part of the class is great for people that want to learn how to look professional and confident by enhancing their own beauty and the beauty of their clients. In the second part of the class we will go over Fantasy makeup by mixing eyeshadows and face paint. Great skill to know for photoshoots, Private appointments and much more. Learn to be a makeup artist for the stars! -Brushes- How to use them and brush sanitation. -Concealer – Discuss the different formulas how to choose the best color and formula for your client in addition- learn how to use concealer for corrective purposes. – How to transform someone into their own character! The title tells it all! This class is all about how to make a face look like anything other than human! This class is all about breaking down the steps and understanding the art fundamentals to render convincing depth, protrusion, tromp loeil, moisture shine, highlight and shadow with face paint. This is a Paint-along fundamentals class so bring your kit! After over 12 years of experience doing strictly Festival Face Painting; I derived a class that teaches the students my Complete System to be able to do festivals solely alone . The artists will never have to worry again about hiring extra painters, line managers or cashier/money takers . This system works tremendously well at festivals and the students are going to love this class due to the large amount of money they would make and also save by keeping their overhead down . This class will explain and teach everything from set up to tear down . From how to book festivals; what questions to ask festival directors and which festivals are the best to apply for . It also teaches organizational skills to be able to perform solely, from setting up your kit, to applying the techniques of my system of painting and controlling the line, to what designs to have on your board and what designs not to have, what designs sell the best and what are the most popular festival designs . 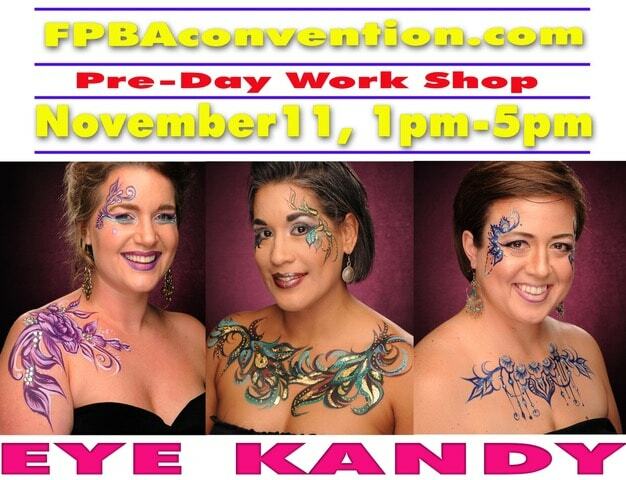 This class also teaches how to incorporate face painting, henna and temporary tattoos all in one booth and be able to do all three solely and be highly and financially, rewarding and successful . Because of the teaching of the three genre’s of art, the students are going to make so much more money because it gives them more of a market of not only doing kids, but all and any age group from infants to the elderly . This is an awesome class and I know the students would love it because it is going to make them so much more $$$ .